"It is important and an increasingly urgent issue," says Prof Kneebone, who warns medical students might have high academic grades but cannot cut or sew. "It is a concern of mine and my scientific colleagues that whereas in the past you could make the assumption that students would leave school able to do certain practical things - cutting things out, making things - that is no longer the case," says Prof Kneebone. 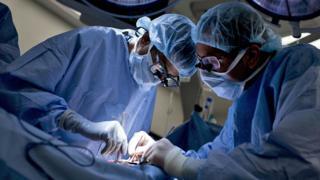 Do smartphones really affect surgeons' skills? "An obvious example is of a surgeon needing some dexterity and skill in sewing or stitching," he says. "A lot of things are reduced to swiping on a two-dimensional flat screen," he says, which he argues takes away the experience of handling materials and developing physical skills. Such skills might once have been gained at school or at home, whether in cutting textiles, measuring ingredients, repairing something that's broken, learning woodwork or holding an instrument. Students have become "less competent and less confident" in using their hands, he says. "We have students who have very high exam grades but lack tactile general knowledge," says the professor. Alice Barnard, chief executive of the Edge education charity, says: "The government pays lip service by saying creative subjects are important, but its policies demonstrate otherwise." "Creativity is not just for artists. Subjects like design and technology, music, art and drama are vitally important for children to develop imagination and resourcefulness, resilience, problem-solving, team-working and technical skills," says Mr Hunt. "These are the skills which will enable young people to navigate the changing workplace of the future and stay ahead of the robots, not exam grades."